"One benefit from having the Pakistan series in the build-up is that guys who are in form will get opportunities to stake their claim for World Cup positions." Wednesday officially marked 50 days to the start of the Cricket World Cup. As Eoin Morgan leads his charges out The Oval against South Africa on Thursday, May 30, it will be the culmination of four years of hard word - turning around a backward and basic team into a progressive, electric side who are quite rightly regarded as pre-tournament favourites. England were embarrassed back in 2015, condemned to a group-stage exit with defeat to Bangladesh - a fourth loss in six, which included an eight-wicket hammering by New Zealand as they chased down a lowly 124 in just 12.2 overs. The turnaround in England's 50-over form, however, was as swift as it was remarkable. It was the visit of the Black Caps later that summer that signalled the gargantuan shift in approach. England registered a score of 400 plus for the very first time in their opening game of the series, the first of four such scores tallied in a stunning four-year stretch - including a world-record 481 fired against Australia last year. To put that in some context, of the other nine nations competing in this summer's tournament, only South Africa have managed to top 400 since the last World Cup - once. Morgan as captain has been at the heart of the turnaround. Thrust into the role four years ago following the firing of Alastair Cook at the 11th hour, Morgan is far more eager for his second taste of skippering at a World Cup. "I'm not quite like a kid before Christmas yet. I'd anticipate that probably happening just before the first game, but it the excitement is growing with every day," Morgan told Sky Sports at the Middlesex CCC media day. Morgan is featuring in two County Championship games for Middlesex and four Royal London One-Day Cup games before joining up with England as the preparations for the World Cup truly begin with the visit of Pakistan. 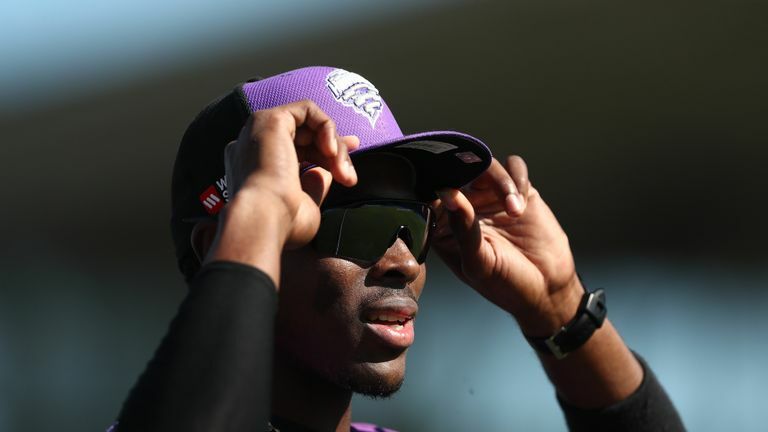 England are rumoured to be announcing their 15-man squad next week, but Morgan is keen to stress the Pakistan series serves as a chance for those on the fringes of the squad to still take a claim for a World Cup place - including Jofra Archer, yet to make his international debut, but now England-qualified. "We play Pakistan in five ODIs, go to Ireland for one game, and we have a T20 in among that. It's a nice way to ease into the summer and get some really good, competitive cricket going," he said. The Cricket World Cup, the Ashes and the Women's Ashes, plus the Vitality Blast, all live on Sky Sports Cricket this summer! "Pakistan are probably second or third favourites for the tournament. They hold the Champions Trophy - playing extremely well to win that, in England - so it's a series we're all looking forward to. "Over the four years we've been together, we have had so many guys who have contributed to the position we find ourselves. "We've gone past a 15-man squad of guys who can contribute into probably an 18, 19-man squad who could all easily be selected for the final 15. "And one benefit from having the Pakistan series in the build-up is that guys who are in form will get opportunities to stake their claim for World Cup positions. "There's tough decisions to be made, sure, but at the same time, there is still more cricket to be played." Pakistan, in particular, will be a test of World Cup-winning credentials, as they shocked a heavily-favoured England at the semi-final stage of the Champions Trophy two years ago on their way to winning the tournament. It is the one criticism that can still be levelled at this England side; are they capable of showing that true ruthless streak necessary to win a title when it comes to the one-and-done nature of the knockout rounds? England similarly fell foul of the West Indies, one stage later, in the final of the 2016 World T20. A recent tied ODI series in the Caribbean - ending a streak of nine bilateral series wins - shows that such 'maverick' sides could still be England's undoing. "It was a really tough series [in the West Indies]," said Morgan. "They're a very exciting team. Chris Gayle was in form, along with a couple other of their batsmen - 2-2 at the end of the series was a fair scoreline. "Not at any stage did we feel hard done by; we had an opportunity in the second game in Barbados to win it, but we weren't good enough to do that. It's an area we're trying to improve on. "But the timing of the series really suited us, because the competitive nature of it really did test us ahead of an important summer. "We're always trying to learn. We're always trying to move forward. It's certainly something we've talked about as a group and will continue to do so in the lead-in to the World Cup." It has not dented the belief in the England dressing room. Far from being daunted by the weight of expectations as World Cup hosts and favourites, the squad are relishing the added pressure. "Within the group, we do believe we can go the whole way. We have to play incredibly well to do that, with a lot of tough teams we'll need to beat, but we certainly believe"
In recent weeks both Alex Hales and Jason Roy have proclaimed England will be victorious come the July 14 final at Lord's. It is a confidence that has been inspired by their captain. "In every World Cup, there's always something new that is identified - every team is scoring 350, every team has a pinch-hitter," added Morgan. "As we go through the tournament, we will have to adapt accordingly. But, being a confident side, in good form, will allow us to adapt better to different positions. "The level of expectation is there because of the performances we have put in over the past few years. Watch the Cricket World Cup on Sky! "Within the group, we do believe we can go the whole way. We have to play incredibly well to do that, with a lot of tough teams we'll need to beat, but we certainly believe." You can watch every match of the 2019 ICC Cricket World Cup on Sky Sports Cricket, starting with England vs South Africa at The Oval on Thursday, May 30. Sky's biggest summer of cricket!